The most common clinical complications associated with resin bonded prostheses are identified along with methods of minimizing or preventing them. Methods of managing the complications are described when they do occur. Knowledge of the factors that cause complications and failure in fixed prosthodontics enhances our ability to develop effective treatment plans, facilitates success, promotes optimal doctor-patient communication regarding anticipated treatment outcomes and provides early diagnosis of problems encountered during long-term maintenance. This presentation will identify the most common complications encountered with resin bonded prostheses and describe methods of minimizing or preventing their occurrence as well as managing the complications when they occur. Metal-ceramic crowns have been widely and successfully used to many decades but today there are more all-ceramic restorations being placed. 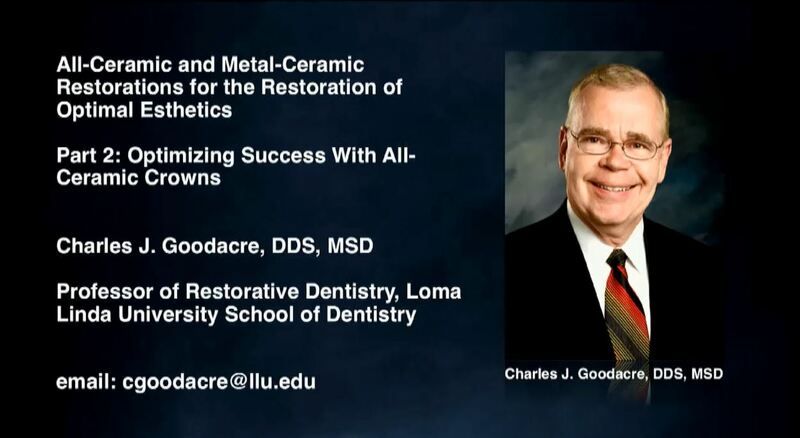 This presentation will compare the two types of restorations based on the factors most important to dentists and their patients. The quest for optimal esthetics coupled with the increased strength of all-ceramic materials has led to a significant increase in the clinical use of all-ceramic crowns and fixed partial dentures. This presentation will identify the key factors that should be considered when determining whether to use all-ceramic crowns or metal-ceramic crowns. What are the esthetic advantages of all-ceramic crowns? How do the different types of all-ceramic crowns compare esthetically? The most common clinical complications associated with all-ceramic crowns are identified along with methods of minimizing or preventing them. Methods of managing the complications are described when they do occur. Knowledge of the factors that cause complications and failure in fixed prosthodontics enhances our ability to develop effective treatment plans, facilitates success, promotes optimal doctor-patient communication regarding anticipated treatment outcomes and provides early diagnosis of problems encountered during long-term maintenance. 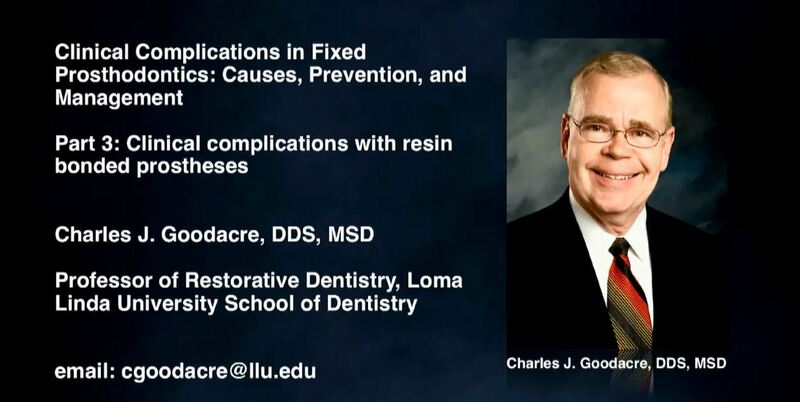 This presentation will identify the most common complications encountered with all-ceramic crowns and describe methods of minimizing or preventing their occurrence as well as managing the complications when they occur. Soft tissue complications present biologic problems that can lead to bone and implant loss and this presentation will discuss the factors that cause such problems occur and how they could have been minimized or avoided. Soft tissue complications present biologic problems that can lead to bone and implant loss. In the anterior esthetic zone of patients with high smile lines, unesthetic soft tissue changes can occur that require special knowledge to avoid the changes. This presentation will identify how biologic and esthetic mucosal problems occur and how they could have been minimized or avoided. A large number of mechanical complications have been reported in the dental literature that could have been prevented through proper planning and design. This presentation will review the complications and discuss how to avoid unfavorable loading. 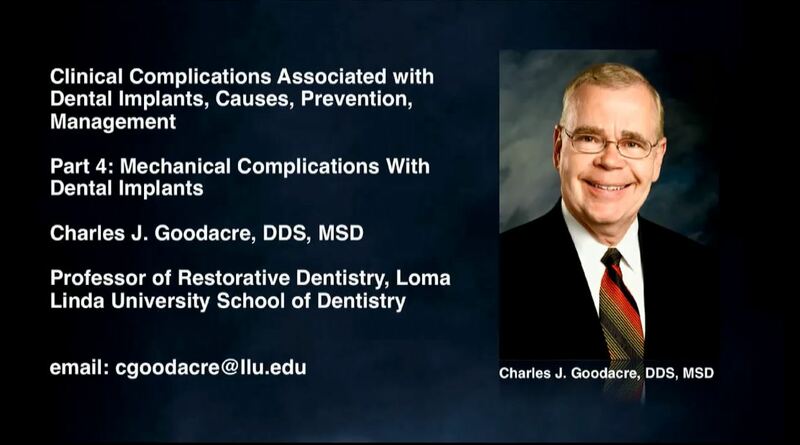 Several mechanical complications have been reported in the dental literature. When proper design guidelines are followed, many of these complications can be minimized or avoided. 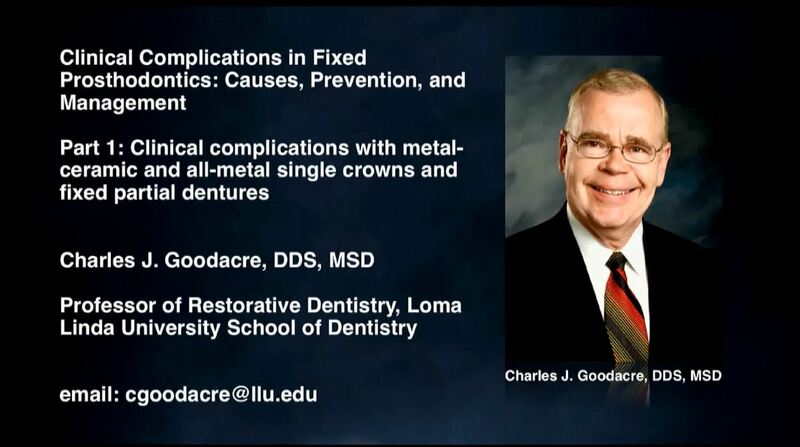 This presentation identifies the most common mechanical complications and presents guidelines that help prevent adverse leverage on implants. 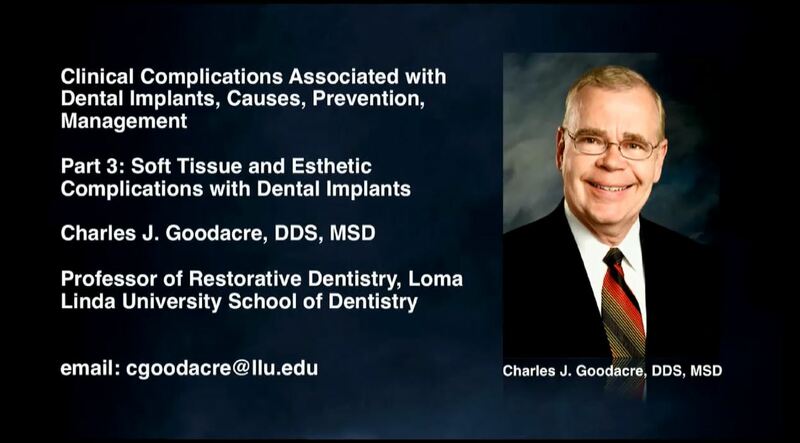 Additionally, when implant placement cannot be ideal or the implants are not appropriately positioned, this presentation describes methods that can be used to resist adverse leverage with both implant single crowns and implant fixed partial dentures. The most common clinical complications associated with metal-ceramic and all-metal restorations are identified along with methods of minimizing or preventing them. Methods of managing the complications are described when they do occur. Knowledge of the factors that cause complications and failure in fixed prosthodontics enhances our ability to develop effective treatment plans, facilitates success, promotes optimal doctor-patient communication regarding anticipated treatment outcomes and provides early diagnosis of problems encountered during long-term maintenance. 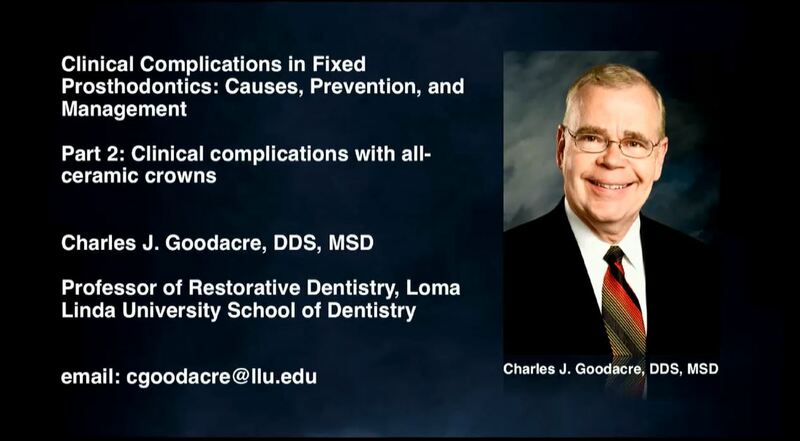 This presentation will identify the most common complications encountered with conventional single crowns and conventional fixed partial dentures and describe methods of minimizing or preventing their occurrence as well as managing the complications when they occur. What is an appropriate total occlusal convergence angle? What is the minimal occlusocervical dimension? What should the occlusocervical-faciolingual ratio be? What can be done when tooth preparation deficiencies are present? Which type of circumferential irregularity produces the greatest benefit? There are a number of factors that must be determined both during diagnosis and during treatment to provide optimal success with all-ceramic crowns. This presentation will describe these factors that optimize success. The quest for optimal esthetics along with the development of increased strength in the materials available for fabricating all-ceramic crowns has led to a significant increase in their clinical use. This presentation lists the most common complications that occur with all-ceramic crowns and discusses the diagnosis/treatment planning factors and tooth preparation factors that help to minimize crown fracture. Additionally, the tooth preparation factors required to optimize the CAD/CAM fabrication process are identified. The effect of the type of material and cementation process are described along with a discussion of ceramic onlays and inlays. 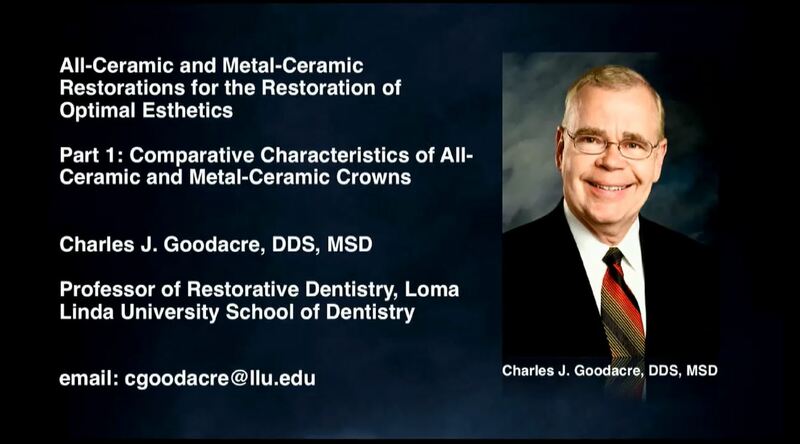 The presentation ends by illustrating the process by which the color of all-ceramic crowns can be optimized. What tooth preparation form is required for CAD/CAM crowns? What do we know about ceramic onlays and inlays? 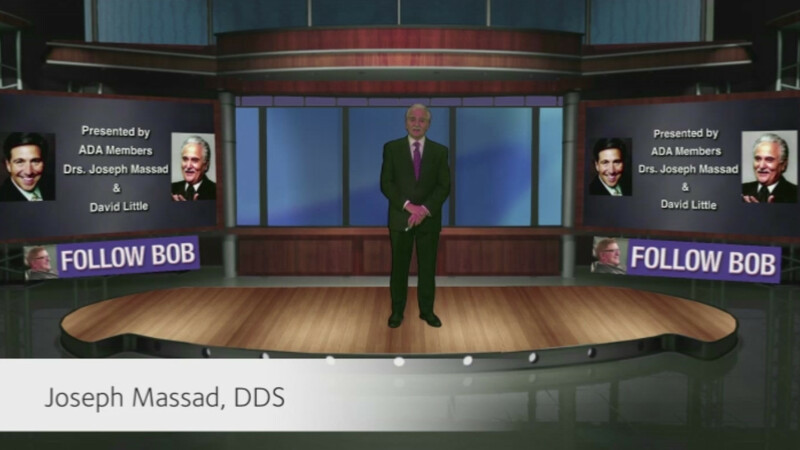 This video will allow the viewer to observe the first appointment the patient and dentist meet and the importance of developing a mutual understanding of patient expectations and dentist methods of obtaining vital information prior to accepting to perform the dental procedures. A series of questions followed by an examination will allow a thorough assessment and eliminate any misconceptions that many times occurs for first time patients having total mouth extractions. The evaluation highlights will be demonstrated as it actually happens from a list of questions fol-lowed by an esthetic analysis, radiograph review, patients existing occlusal vertical dimension compared to rest vertical dimension and final discussion with patient before committing to treatment. Please join us for Part I. Implement making facial recordings to determine the esthetic & functional spaces. 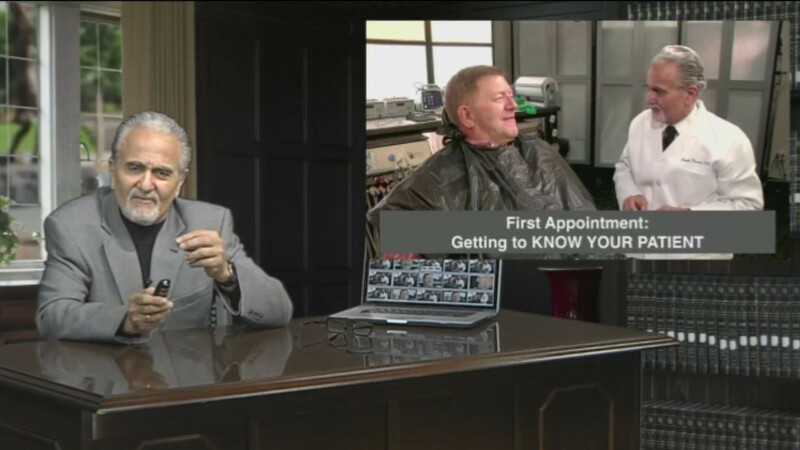 Ask predetermined questions at the assessment to improve patient dentist relationship. Determining the outcome before committing to treating any patient. The treatment options available for a patient with non-restorable dentition with closed vertical occlusion combined with a moderate skeletal class 3 relationship are conventional complete dentures, implant-supported overdentures (removable), fixed implant-supported complete dentures, and fixed metal-ceramic implant-supported restorations. This video will allow the viewer to observe the steps in fabrication of provisional maxillary and mandibu-lar prostheses along with extractions, bone reduction and implant placement with the utilization of a spe-cifically designed bone reduction glide followed by an implant osteotomy guide and mandibular implant placement. Implement taking patient recordings and fabricating the prostheses. Understand and implement facial recordings to determine the esthetic & functional spaces. Implement scanning both the jaws and the prostheses to fabricate surgical guides. Understand and be able to execute whether or not bone reduction will be needed to conform to the optimal final prosthesis. Convert a complete denture to a fixed denture directly after implant placement.